Winds A Bit Light, But Thermals Helped Out! With a 2-leg bridle fitted, the 1 Skewer Rokkaku kite had some great flying today, in winds gusting to over 10 kph. I brought my favorite toy from Christmas Day with me ;-) It was a wind speed measuring device, the Windtronic 2 from Kaindl Electronic, a German company. The wind meter was soon set up on a mini camera tripod, in fact the one that came with our digital camera. The tiny wind turbine whirred silently while I went about attaching the flying line and putting the kite up. This oval was not infested with tall weeds like some others around this area! Hence no chance of the flying line or tail snagging all the time. Somewhat annoying! Today, the weather was very pleasant for flying. Sunny, few clouds and a light breeze. The winds seemed so light that I ventured to remove the last section of tail plastic from the 1 Skewer Rokkaku kite. Perhaps it wouldn't mind, and it would be a tiny bit less drag on the kite. Indeed, during the lulls there was not quite enough breeze to even keep the little Rok in the air. However, I persisted, and eventually managed to get some photos and video. About 15 meters (50 feet) of flying line was out. The kite seemed to be pulling a bit too hard, and looping, so I shifted the towing point forward a few millimeters. With photos out of the way, 60 meters (200 feet) of line went out after much line-working and a couple of landings! The tiny Rok settled out at around a 30 degree angle much of the time, sometimes lower when the wind was even lighter. To the point of nearly half the line draping onto the grass, while the kite gamely hung on. Just hovering there, suspended several meters above the ground! 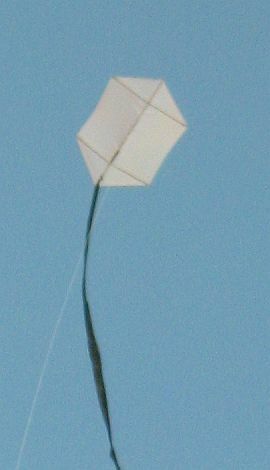 Once or twice the 1 Skewer Rokkaku kite went to 60 degrees or more in some moderately strong thermal lift. It feels like this kite will fly at around 45 degrees in ideal wind strengths, on 60 meters (200 feet) of line. Albeit with quite a bit of sag! Sag or no sag, there was room at this fairly large school oval to let out more line... With 90 meters (300 feet) out, I threw the winder around the trunk of a handy tree. The 1 Skewer Rokkaku kite evidently has a slight right-turn built in, which caused looping during stronger gusts, and generally limited the height achieved. So I brought the kite down and added back the tail section which had been removed earlier. I also shifted the towing point back just a fraction. Walking back to the tree, I noticed the kite's shadow creeping upwind as the little Rok soared higher and higher directly above. Watching the kite for several minutes, it was surprising how much difference the extra length of tail was making! The Rok flew straighter, smoother and higher than before. It was a pleasure to watch the long, gently weaving climbs as the wind strength freshened from time to time. For tech-heads: regarding the maximum height, the reduced tendency to loop outweighed the effect of the increase in drag of the extra tail. By far! According to the Windtronic wind meter, the breeze had averaged 3.3 kph most of the time, rising to 3.4 kph for a while. Max wind speed at ground level was 10.2 kph. But I'm sure it was more like 15 kph higher up. With 5 minutes to go before wife and child would expect to be picked up from the close-by supermarket, I brought the Rok down. Nice flight!